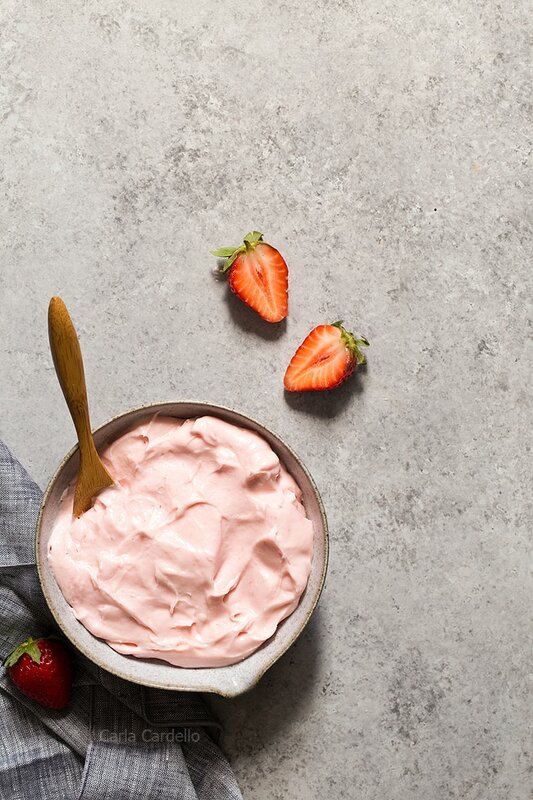 Learn how to make this fresh small batch Strawberry Cream Cheese Frosting with real strawberries. Makes enough to frost 6 cupcakes or one 6 inch cake. Last week I read a post that was a long time coming. According to my age, I’m supposedly a millennial, growing up in a world immersed in technology. I’m narcissistic, lazy, and expect to be coddled with participation trophies. Except I grew up in a time without technology. I passed paper notes in high school. I didn’t get my first cell phone until my freshman year in college. I don’t think my family even had the Internet until I was in middle school. Of course you couldn’t actually use it if somebody else was on the phone. When I went on field trips, I used disposable cameras. I’d have no clue how the photos turned out until the film was developed. My parents did have a Polaroid camera, but it didn’t work half the time. When there was a new song on the radio, I’d wait with a blank cassette tape on hand, pressing the record button as soon as the DJ stopped talking. Most of the time they talked over the song intro, so it was hit or miss. True millennials never experienced a life without technology. They were born into it. Me on the other hand – I’m caught in between millennial and generation X. That’s when I read about a new term called Xennials. Of course the date range doesn’t include my year, but the whole article describes me to a tee. Growing up the way I did shaped the way I cook and bake. I learned how to cook in home economics class. Everything was made from scratch. No cake mixes or canned soup. It became an obsession of mine, although I have been a little more relaxed once I started working full time. A few years ago, I posted strawberry cupcakes with strawberry cream cheese frosting. No cake mix. No Jello. All fresh strawberries. My Small Batch Strawberry Cream Cheese Frosting became popular enough to deserve its own post. 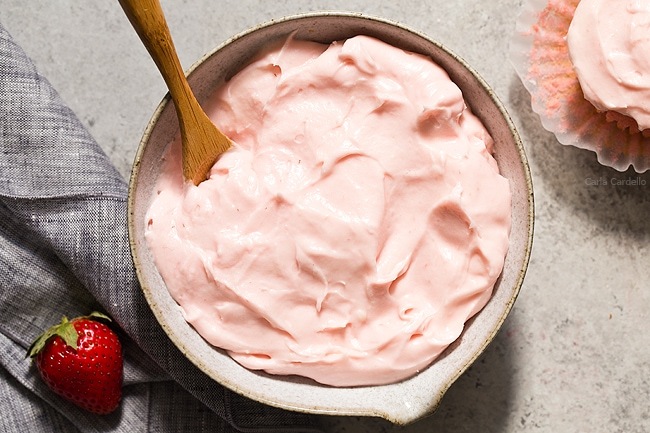 It really is the best strawberry cream cheese frosting recipe! Use it to frost cupcakes, strawberry layer cake, or strawberry snack cake. There is a little bit of cooking involved, but it’s the best way to get the most strawberry flavor. You also don’t have to worry about chunks of strawberry getting stuck in your piping bag (affiliate link). 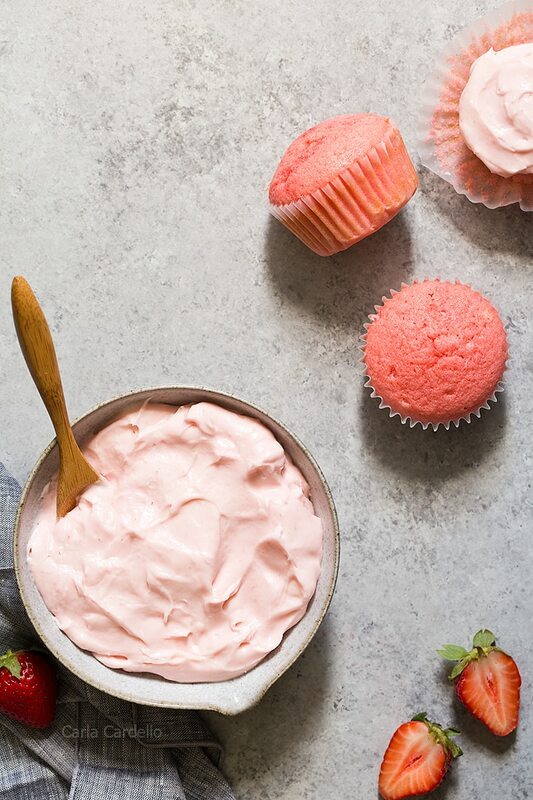 Typically the cream cheese frosting is naturally pink from using strawberries. However, if your berries aren’t juicy enough, you may need to add a drop or two of red food coloring. 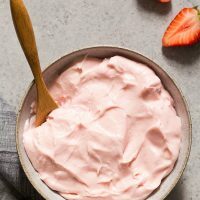 It’s important you follow the directions and cook the strawberries down enough to equal 1 1/2 tablespoons; otherwise, your frosting will be too runny. This means actually measuring it and keep cooking until it’s 1 1/2 tablespoons. Please don’t skip this step. And depending on how warm your kitchen is (especially during the summer), if it’s a little too soft for piping, refrigerate the frosting for 15 minutes or until it starts to firm up again. 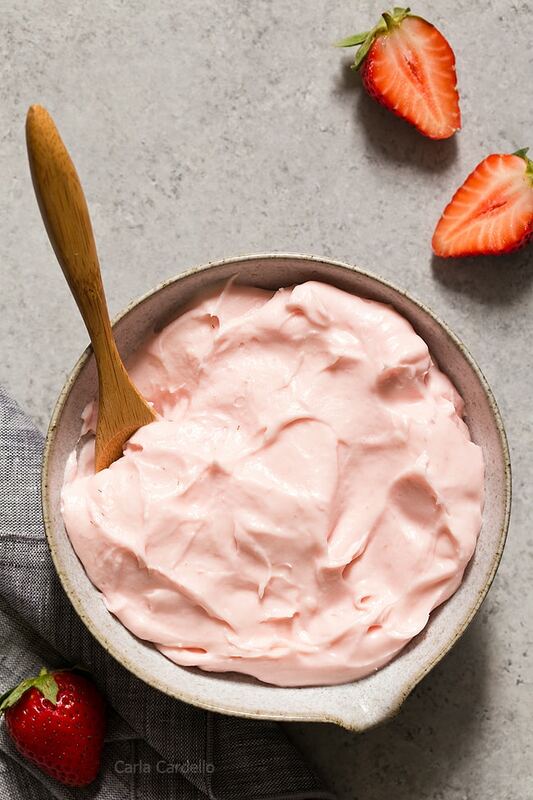 Learn how to make this fresh small batch Strawberry Cream Cheese Frosting with real strawberries. In a blender, add the the strawberries and granulated sugar. Process until smooth. Pour through a fine mesh strainer, discarding any solids left behind. You should have 1/4 cup puree (if you're doubling the recipe, it'll be 1/2 cup). Add the puree to a medium saucepan and bring to a boil over medium heat. Turn down to simmer and cook for 5-10 minutes or until the puree thickens and cooks down to 1 1/2 tablespoons (please measure as anything more will make the frosting runny. If you're doubling the recipe, cook it down to 3 tablespoons, about 10-15 minutes). Cool to room temperature (or refrigerate until cold to speed it up). In a large mixing bowl, beat together the butter and cream cheese for 30 seconds or until combined then add the powdered sugar and salt. Beat until light and fluffy, 3-5 minutes. Beat in the strawberry mixture and vanilla. If the frosting isn't pink enough, add a few drops of red food coloring. anywho. This frosting is amazing and I need to come up with something to make for Michael that I can frost with this! Can salted butter be used if you omit the salt ingredient? Yes, you can since it’s only a pinch of salt. I made this icing today for my fresh strawberry cake. Let me just say it was delicious. I didn’t quite puree the strawberries, and omitted step 2 altogether. Thank you for the great recipe! Glad you enjoyed it! Step 2 is for strawberry puree because it’s usually too thin on its own. However, since you said your strawberries weren’t that consistency, I can see why you may not have needed that extra step. Help. My strawberry purée won’t thicken. It’s been cooking for over 20 minutes. How high is your heat? How much puree do you have after cooking it? Electric stove top at 2. I had 2 cups of strawberries after I put them in the blender. I thinking I need to be patient. How much frosting are you making? That’s definitely more than what I call for, so yes you’re going to need more cooking time. Also your heat sounds really low. Make sure it’s still simmering a bit when you turn down the heat. Those strawberry cupcakes are just too darling! And you be you! My mom made a starwberry frosting when I was young that I loved. This looks very similar! It looks delicious. Strawberry cake reminds me of my grandmother because she would always make it for our birthdays. I like the idea of using cream cheese to cut back on the sweetness a little. Her recipe was always so very sweet. Yes, the cream cheese definitely helps with the balance! Let me know if you try it. I stumbled upon your lovely blog because I’m making strawberry cream cheese frosting for my daughter’s 6th birthday! Today, no less. Boxed cake, sadly, but I’m more a cook than a baker (and I know I’d butcher the poor thing if I scratch made it). I love your approach to this – simple and unpretentious. Thank you for that! I immediately identified because I am a GenXer. Born 1975. I, too, passed folded notes in class, taped songs even if that rotten DJ talked over it, and remember when MTV actually played videos. With that said, thank you for the recipe. I can’t wait to make it! Happy birthday to your daughter! Don’t beat yourself up too hard over making boxed cake to go with this frosting. Your daughter will love it regardless! I just love how fluffy this looks. Strawberry Cream Cheese Frosting is my weakness so I am not sure that bowl would make it on top of a cake before me eating it all! This is a great frosting recipe! Perfect for any holidays desserts and cakes! I like taking fresh strawberry frosting and using it as a topping for my waffles. I know it’s not healthy, but it’s not any worse than syrup! Pile on a few chopped strawberries and it’s just divine! If you do have some leftover after frosting your cake, I think spreading them on waffles would be an excellent breakfast! Oooo! That looks so creamy and dreamy! It would go so well with a vanilla cake. I might have had to make another batch…’sampling’ too much before I got the cupcakes out of the oven. My husband made homemade chocolate cupcakes for Valentines day, and I made this recipe for the frosting, sooooo good! I doubled the recipe, but only used 2 cups sugar, as we don’t like it too sweet, and it came out perfect! Definitely my go to recipe now for frosting! Oh perfect! Glad you enjoyed the recipe. Do you think this would work with low fat (not fat free) cream cheese? I think I probably already know the answer but I just have to ask. ;) Sounds wonderful and exactly what I’ve been looking for! I haven’t tried it with low fat cream cheese. Usually the low fat and fat free tend to be more watery. Sometimes you can use Neufchatel and still be ok. I’ve only made this recipe with regular cream cheese. If you try it, let me know if it works! Please describe how the frosting turned out so I can try and help troubleshoot.